With all of the hoopla over this weekend’s release of Man of Steel, Amazon has lowered the price on last year’s Smallville the The Complete Series boxed set. I’ve had my eye on this set for the last 8 months and this week it was finally on sale for an irresistible price. 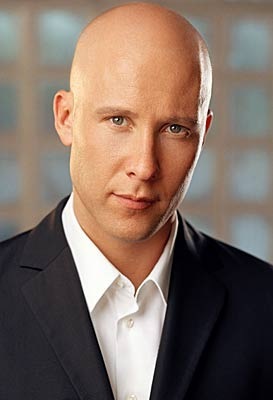 Yes, Michael Rosenbaum has succumbed to the pleas, entreaties and, possibly, threats from Smallville fans and will, indeed, appear in the series finale. After Ten Years Smallville Wraps Up With A Two-Hour Series Finale! When Smallville premiered ten years ago, the series creators, Alfred Gough and Miles Millar promised two things: no flights and no tights. From the series beginning, the intention was to end the series with Clark Kent becoming Superman. On May 13, 2001, Smallville closes its ten-year run with a two-hour finale. Some thoughts from the press release for the finale follow the jump. 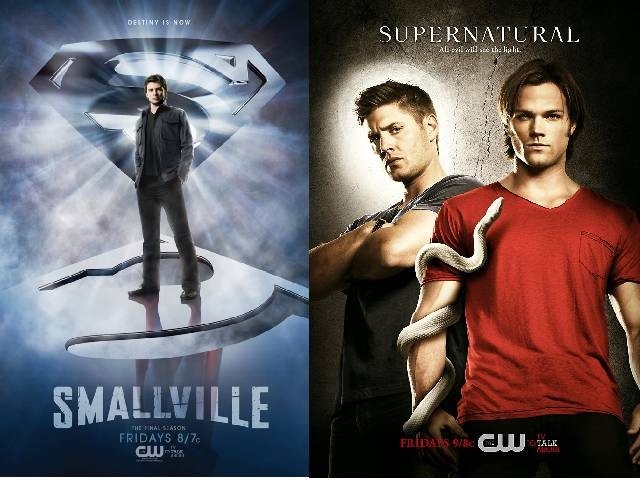 Television: The Wait is Over- New Episodes of Smallville S10 & Supernatural S6 On the CW Tonight! After an extra week delay in coming back from hiatus, The CW Network is set to air brand new episodes of their hit actions series’ Smallville and Supernatural. So it’s official, The boys of action and adventure (and some girls too) are back! Dinah warns the others that Chloe may now be a traitor. Oliver dismisses her concerns but Clark is unsure if he can trust Chloe after she disappeared without an explanation. Cassidy Freeman also stars. Morgan Beggs directed the episode written by Jordan Hawley. (Julian Richings) was able to restore his soul without causing Sam to lose his mind. Meanwhile, Dean and Bobby investigate a disappearance of virgins and discover dragons are behind the kidnappings. Bobby sends Dean to a doctor who owns the only weapon in the world that can slay a dragon, but Dean must prove himself worthy enough to take it. Phil Sgriccia directed the episode written by Adam Glass. Having seen an advanced preview of Supernatural S6.12 Like a Virgin, I am even more impressed season 6 of Supernatural which, as a viewer, I feel has been the best since season 2. That’s not to say that other seasons didn’t have their exceptional moments, but season 6 of Supernatural is more than just exceptional moments. The season so far has had many exceptional episodes in my opinion and S6.12, Like a Virgin, is yet another one. Like a Virgin is an interesting and multi-layered title for a very multi-layered episode of Supernatural that, I believe, is going to become a fan favorite. I can’t give away too many details, but I can say that Supernatural fans are in for a ride that is both satisfying and culminates in meeting up with a new ‘big bad’ that may well make Lucifer look like a choirboy! Fans and viewers of the CW hit series’ Smallville and Supernatural, who were ready to sit down to new episodes on Friday the 28th of January, are in for some disappointment. The CW Network has released a revised programing schedule which moves The Vampire Diaries and Nikita into the Friday, January 28th schedule for special encore airings of recent episodes. At 8 PM EST The CW will air an encore of The Vampire Diaries’ episode, Descent. At 9 PM The CW will air an encore presentation of Nikita episode, Free. 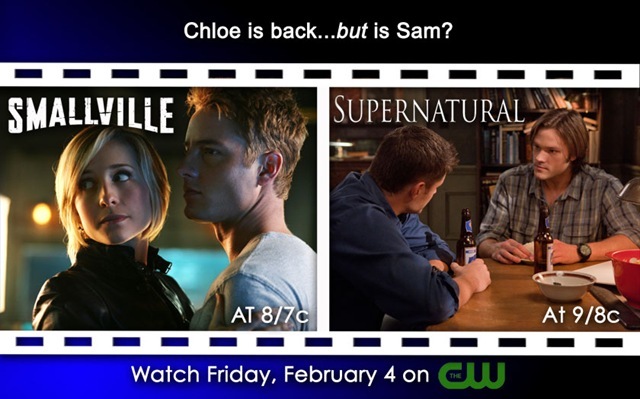 New episodes of Smallville and Supernatural are now set to air on Friday, February 4th. CHLOE SULLIVAN RETURNS TO SMALLVILLE — Clark (Tom Welling), Oliver (Justin Hartley), Lois (Erica Durance) and Dinah (guest star Alaina Huffman) are released by the VRA after being captured at Hawkman’s funeral but each of them have flashbacks of Chloe (Allison Mack) holding them against their will. When Chloe returns, Dinah warns the others that Chloe may now be a traitor. Oliver dismisses her concerns but Clark is unsure if he can trust Chloe after she disappeared without an explanation. Cassidy Freeman also stars. Morgan Beggs directed the episode written by Jordan Hawley. Supernatural will follow in its normal 9 PM time slot with episode S6.12, Like A Virgin. DEATH RETURNS FOR A MEETING WITH DEAN — Dean (Jensen Ackles) and Bobby (Jim Beaver) anxiously wait for Sam (Jared Padalecki) to wake up to see if Death (guest star Julian Richings) was able to restore his soul without causing Sam to lose his mind. Meanwhile, Dean and Bobby investigate a disappearance of virgins and discover dragons are behind the kidnappings. Bobby sends Dean to a doctor who owns the only weapon in the world that can slay a dragon, but Dean must prove himself worthy enough to take it. Phil Sgriccia directed the episode written by Adam Glass. Think you have what it takes to stand up and help The Justice League battle against evil? Then here is your chance! The CW’s hit series “Smallville” (Fridays, 8:00–9:00 p.m. ET/PT) wants to hear from you. Fans of “Smallville,” from Warner Bros. Television, will have a once-in-a-lifetime chance to appear in an upcoming episode of the 10th and final season via the “Smallville:” Believe in Heroes Challenge, a 10-day promotion running from Friday, December 10—Monday, December 20, on CWTV.com. In the episode “Beacon,” to be broadcast on Friday, February 4, Clark (series star Tom Welling) is at an emotional crossroads, with Metropolis divided by a clash between supporters of the government’s Vigilante Registration Act and opposing rallies to generate support for indispensable heroes like The Blur. In an effort to help a disheartened Clark Kent, his friends assure him that he is, indeed, making a difference in his crime-fighting role as The Blur. To prove their point, they show him videos from the Internet in which ordinary citizens express what The Blur means to them, what it means to be a hero – and what it means to have heroes and believe in them. One of these videos could be yours! Beginning Friday, December 10, at 11:00 a.m. Pacific Time, and continuing through Monday, December 20, at 11:00 a.m. Pacific Time, “Smallville” fans can submit their own video testimonial as one of these hopeful citizens by uploading videos to The CW’s official website. In these videos, viewers – speaking in character as impassioned citizens of Metropolis and around the world, fighting for the rights of their heroes – can express what The Blur means to them and talk about why they believe in these super heroes. Smallville” producers and the CWTV.com team will review the submissions and select a number of the user-submitted videos for broadcast as the testimonials that Clark watches during the “Beacon” episode airing Friday, February 4 (8:00–9:00 p.m. ET/PT) on The CW. In addition to selecting the winning videos to be used in the episode, the “Smallville” producers and CWTV.com team will also select a number of additional favorite videos that will be posted to CWTV.com following the broadcast. For information on how to submit videos and for rules of the promotion click here. For the first time ever, TV Guide is letting the fans decide which show should be on their cover. Here’s the good news for fans and viewers of the CW Network’s men of action. If you love Smallville starring Tom Welling as Clark Kent and Justin Hartley as Oliver Queen/The Green Arrow and Supernatural starring Jared Padalecki and Jensen Ackles as Sam and Dean Winchester, you don’t have to chose which one to watch. 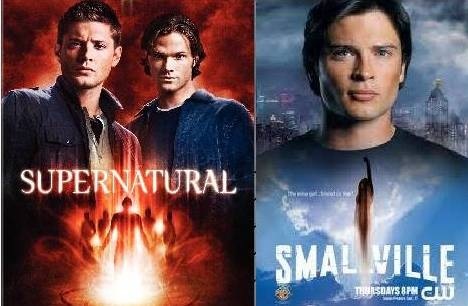 The two hit CW action series air back to back on Friday nights beginning at 8PM EST with Smallville and moving on into 9PM EST with Supernatural. Here’s the bad news. Only one of them can possibly win the spot on the December 13th cover of TV Guide Magazine and they can only do it if you vote for them. Ah the dilemma of choosing between the Man of Steel and the Green Arrow or the monster hunting, demon fighting brothers Winchester (with the Angel Castiel thrown in for good measure). Well, there is a little bit more good news. 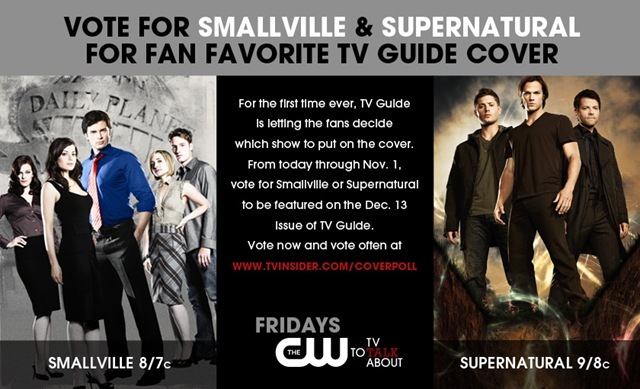 Both Smallville and Supernatural have been nominated due to their incredible fan bases and both need you to vote now to help one of them win the December 13th cover! You can vote as often as you like. so please take the time to vote now at the TV Guide cover poll. SMALLVILLE – A Special Episode #200 and on the Path to Making History! Tonight, SMALLVILLE will reach a television milestone and continue on a course to science fiction history! The very special episode #200, which finished filming in September, will air this evening at 8pm on The CW. The cast and crew were celebrating this momentous milestone with a party at the end of September in Vancouver, at about the same time when the tenth season was premiering on our screens. In terms of number of episodes, every set of ‘100’ represents approximately five years of imagination, dedication, and hard work. And all the people involved with the series for the past nine years have definitely earned the right to celebrate. This tenth season will also be the final one, despite the series continuing to show ongoing viewer support and creative growth. From an artistic standpoint, having a specific end-date in sight will allow the creative team the opportunity to bring the storylines to a natural close as Clark Kent continues on his path to becoming The Man of Steel. Ever since the first season in 2001, the producers have declared ‘no tights, no flights!’ referring to their desire to explore the early years of Clark Kent before he becomes the iconic hero known as Superman. Despite several story directions, which found small loopholes around this decree, even earning the eye-rolling frustration of fans waiting for Clark to don the red and blue suit – or at least to jump a tall building in a single bound – the creative team stayed true to its word. Until now. This will be the season that Clark Kent makes the full transformation into Superman and the series is ready to pull out all the stops! 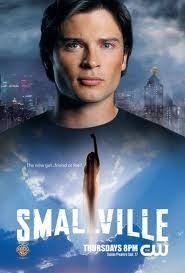 SMALLVILLE is also now set to make sci-fi history. Up until this year, STARGATE SG1 has been the longest consecutively running live-action Sci-Fi series in North America, having aired 213 episodes. This accomplishment has earned it a place in the Guinness Book of World Records, and makes it second only to the British DOCTOR WHO in the worldwide standings. At the point that SMALLVILLE will almost be reaching the end of this tenth and final season, it will air episode #214 and thereby earn its place as the new record-holder. And that is quite an accomplishment for a science fiction show that has fought against great odds to reach this point. Episode #200 is titled ‘Homecoming’ and it will contain something for everyone, whether you have watched it faithfully for nine years or tuned out after three. For viewers who may have lost track of the series, returning to watch this episode will be like a homecoming of their own. Highlights and pictures, after the jump. Television: The CW Network Smallville and Supernatural Boys Are Back Together & Kicking It on Friday Nights! After being separated for a season when The CW Network moved Smallville to Friday nights, Dean (Jensen Ackles) and Sam (Jared Padalecki) Winchester and Clark Kent (Tom Welling) are back in action together. For its sixth season, Supernatural was moved to the 9 PM Friday night time slot right after the tenth and final season of Smallville and that turned out to be an action packed ratings ramp up for The CW Network. The premiere of SMALLVILLE’s final season with episode S10.01 Lazarus, kicked off the night by won its time period in adults 18-34 (1.3/5), men 18-34 (1.6/7), men 18-49 (1.5/6). The CW’s SMALLVILLE outperformed both ABC and FOX at 8:00-9:00p.m. 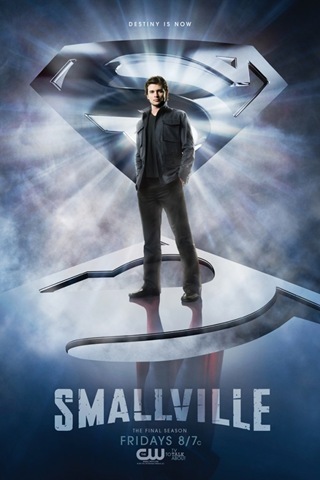 in adults 18-49 (1.3/5).SMALLVILLE delivered The CW’s best performance in the Friday 8-9pm time period in 2 years in total viewers (3.0 mil) and adults 18-49 (1.3/5). The debut of the sixth season of SUPERNATURAL with the episode S6.01 Exile on Main Street, was first the 9-10pm hour in adults 18-34 (1.4/5-tie), men 18-34 (1.5/6) and men 18-49 (1.4/5-tie). SUPERNATURAL ranked third in the hour among total viewers (2.9mil) and adults 18-49 (1.3/4). Compared to its season premiere last year (on Thursday), SUPERNATURAL was flat year to year in adults 18-34, and up 25% in men 18-34 and 17% in men 18-49. SUPERNATURAL scored The CW’s best performance in the time period in 2 years in all key categories, including adults 18-34 (1.4/5), adults 18-49 (1.3/4), men 18-34 (1.5/6), men 18-49 (1.4/5) and viewers (2.9mil).